Maybe you’re not quite ready to have a VA working for you, but you know you need to get a better handle on your admin. 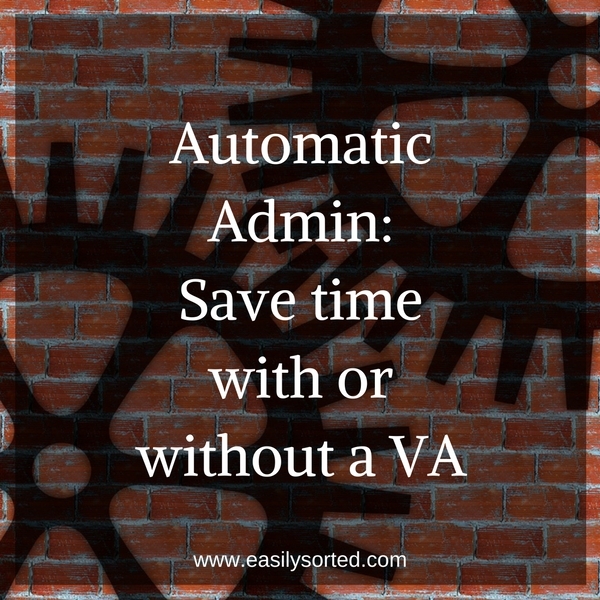 So this week, I’ll help you to make your admin go a little easier, by using automatic processes – with OR without a VA. This is how I found an extra 4 hours EVERY month. Even if you can’t afford to work with a virtual assistant yet, you can use these six tips to get better control over your admin. Set up your email list to get an automatic email every time you publish a new blog post. In MailChimp, you can set up an RSS campaign which will check for new website content. When it finds new content, it will send out an email to your list. Install a WordPress plugin to automatically share new blog posts to social media. I use Zapier to check my blog every 15 minutes, so when I publish a new post, it automatically posts to FaceBook and Pinterest. Several WordPress plugins do similar things. Set up all your monthly payments to direct debit, or other automatic payments. If you pay for things like Dropbox, Buffer, or a web hosting account, chances are they already bill you automatically. But have a look at all the other payments you make for your biz every month. Can you set up more of them to be paid automatically? Connect your bank & PayPal accounts with your online accounting software to automatically bring in new transactions. I LOVE this one. I use Xero, and I have my bank and PayPal accounts integrated with my accounting. When new transactions turn up, Xero notifies me that I need to reconcile them. All I need to do is categorise them and approve. More advanced Xero users can set up rules for transactions so you don’t have to enter the same details each time. Just click to approve and it’s all done! Schedule invoices to go out to clients on the same day each month. Do you have customers or clients who get billed the same amount every month? Why spend time doing each individual invoice, when you can schedule them ahead of time to go out monthly? Most accounting packages can do this easily. Write some ‘canned’ email responses to send out to potential clients and customers. Every business has questions that potential clients and customers ask frequently. Instead of coming up with a response on the fly, spend a few minutes composing responses to your most frequent questions. The next time someone asks that question, simply copy and paste your response into a return email. Or, most email clients nowadays will store pre-written emails for you, so you can insert the response you want. What other ways do you make your admin easier?